In Greek mythology, a phoenix is a bird that dies in a “show of flames and combustion,” then arises from the ashes to live anew. 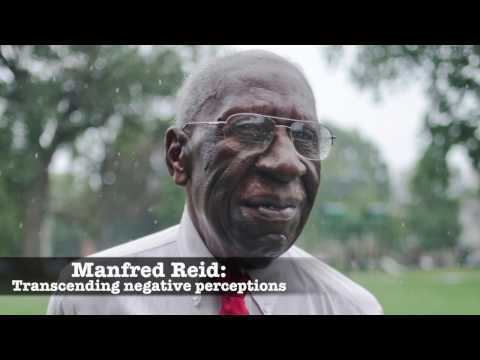 And Manfred Reid of Louisville, Kentucky, is a modern-day, human phoenix. Caught up in the civil rights clashes of the 1960s, the man who was once a prominent, well-respected real estate broker lost virtually everything—his job, his marriage, his reputation and, eventually, his home. Today, however, he is a widely recognized city leader, heading the revitalization of the Russell neighborhood—once known as the “Harlem of the South”—and chair of the board of commissioners for the city’s Metro Housing Authority. Two long years later, all six were acquitted. But the ripple effects were lasting. When the dilapidated, foreclosed “fixer-upper” in which he found refuge was condemned, he was placed in Beecher Terrace, the largest public housing complex still left in the country. He had hit the proverbial bottom. The rest, as they say, is history. Reid went to that meeting, became a leader, and when the housing authority put out a call for a resident to serve as the first such representative on the board of commissioners, he was recommended. Reid joined the commission in 1999 and has served as its chair since 2000. He has, however, remained a resident of public housing even though he could now move out. One of the largest projects Reid helped oversee, and of which he is the proudest, was the demolition and rebuilding of three of the public housing buildings. “We successfully relocated every family who qualified,” he boasts. Today, however, Manfred Reid is a widely recognized city leader, heading the revitalization of the Russell neighborhood once known as the “Harlem of the South." It was through his work with the commission that Reid re-connected with NeighborWorks member New Directions, which he had first come to know through his real estate business and works with the authority to promote resident engagement. New Directions runs bimonthly neighborhood roundtables, through which it offers residents information on local services and issues, as well as training on how to be effective community leaders. Manfred has been a regular participant, representing the historic Russell Neighborhood, which includes Beecher Terrace. With the help of an action grant awarded to resident teams who attended NeighborWorks America’s Community Leadership Institute, Manfred led a bus tour of the community for roundtable participants, showing it off through his eyes. Once the home of the “chitlin circuit” and the black aristocracy, including the church where Martin Luther King Jr.’s brother preached, Russell was devastated by the urban renewal craze. On Jan. 16, 2015, however, the housing authority was awarded a $425,000 Choice Neighborhoods planning grant from the U.S. Department of Housing and Urban Development and ambitious planning now is underway—in which Reid is integrally involved.